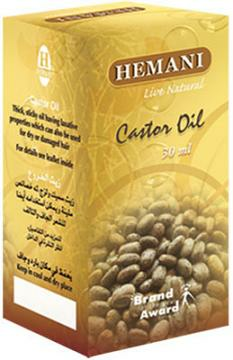 Castor oil is extracted by pressing the seeds of castor plant, also known as Ricinus communis. It is a vegetable oil and the plant is largely native to Africa and India. The oil has been famous in the world over for centuries for its anti-inflammatory and anti-bacterial properties. Buy Hemani Castor Oil 30ml, sold & shipped by Mahavir Wholesale where you can shop online for Grocery Products of India - Patanjali, Chai, Henna & Beauty Items. This Ayurvedic collection has been tagged as Ayurvedic home remedy, , natural oil, Hemani products.